Miss Crawford deposes that she never did - "Who the hell am I to criticize anybody?" She acknowledged there was a little incident about chocolate cake and a doily. A columnist in the Washington Post said today the actress did indeed subject the justice's wife to a "belittling barrage" about the bride's background and manners. 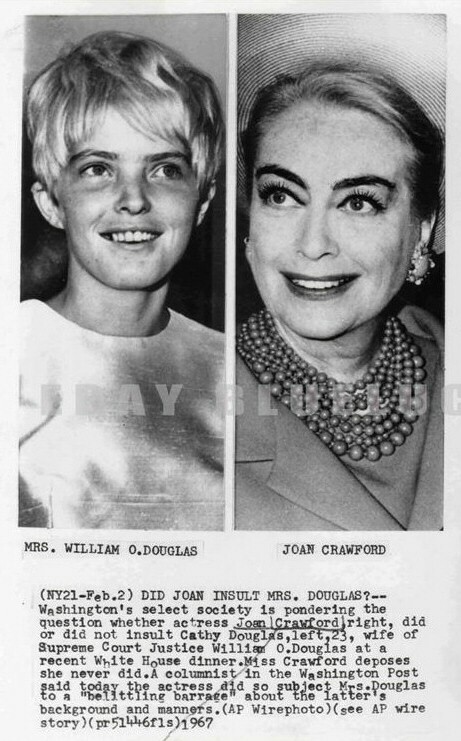 And the judgment of Judith Axlar, New York Daily News columnist, was that "Miss Crawford wasn't acting queenly that night." Miss Axlar's report appeared in her "DC Wash" column on Sunday, Jan. 22. Maxine Cheshire, writing in the Post, said, " At the state dinner where members of The Supreme Court and their wives were guests, the youthful Miss Douglas found herself seated at a table with actress Joan Crawford. The one time screen queen began a belittling barrage that continued throughout the meal. She insulted Cathy Douglas repeatedly with scathing, scornful remarks about her background, her manners and even her much-publicized love of the outdoors. "This situation got so tense that the three men seated closest to the two women rallied protectively around Mrs. Douglas. Presidential Assistant Joe Califano, between the ladies, tried gallantly to keep them separated verbally. The U.S. ambassador to the OAS, Sol Linowitz, did what he could to divert Miss Crawford's attention. "Finally, Interior Secretary Stewart Udall, who was the host of the table, felt called upon to defend Mrs. Douglas and began answering every spiteful comment aimed at her. "This failed to put Miss Crawford in her place. She eventually made one action speak louder than all of her unkind words. When finger bowls were set before each guest, she rose halfway out of her chair and leaned across Califano. She then snatched doily and all from in front of Mrs. Douglas and deposited them where Emily Post says they should be. The implication was plain that a girl of humble origins, dining for the first time in such splendor, would not know what to do with a finger bowl unless shown." In a telephone interview from Los Angeles, Miss Crawford had this to say about the column: "I've never heard of anything so ridiculous. I have not even met Mrs. Douglas. She was at the table one seat removed from me. There was a man between us. I didn't attack her. Besides, who the hell am I to criticize anybody? I was a waitress, too, from the time I was 9." Referring to the finger bowl incident, Miss Crawford said: "She started to put her chocolate cake on the doily. I said excuse me to the gentleman on my right and took the doily off of the plate. She didn't seem upset. We didn't exchange one word. I didn't meet her; there were 150 people at that reception." The actress said that when Miss Axlar's column appeared, she wired the Douglasses that she was "terribly sad" about the "erroneous" action attributed to her. "Bless you," she wired, "and there are kind people everywhere including Joan Crawford." Miss Axlar's column about the dinner said "When the subject turned to wilderness areas - a pet project of Udall's - young Mrs. Douglas volunteered that she preferred them to national parks. "Now that you've come up in the world, you can afford to" Crawford said. "Miss Crawford, there's nothing in the world that costs less than to take a sleeping bag into the woods for a vacation," Mrs. Douglas said, a little shakily. "Before dessert when the crystal finger bowls were being passed around, the 67 year old Justice's bride was engrossed in conversation and neglected to pick up her lace doily with her parsley sprigged plate of water. Miss Crawford made a point of reaching across three people to lift Mrs. Douglas' bowl, put the doily under it and deliberately set down the bowl." "That's the way we do it," Crawford said icily. Mrs. Douglas managed a startled thank you. "That was the first time that I've ever been insulted in Washington," she said later. "Up to now everyone has been so nice." Thanks to Ed Guinea for sending in this article.